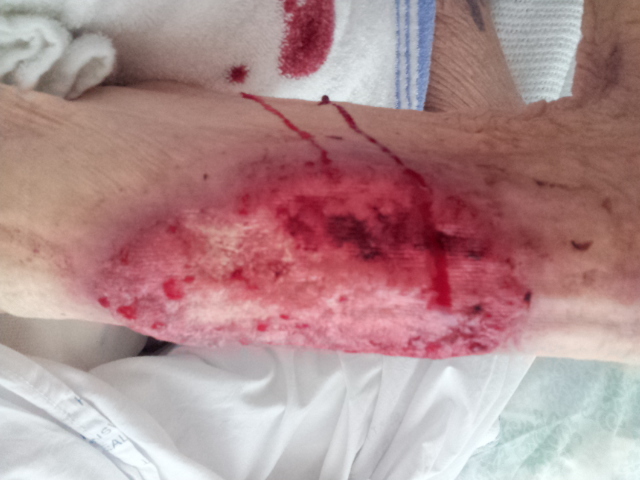 A frail elderly woman resident in a nursing home presents with a persistently bleeding lesion on the left anterior thigh. She is not demented. there is a large (20cm) ulcerated skin lesion on the anterior aspect of the left thigh. 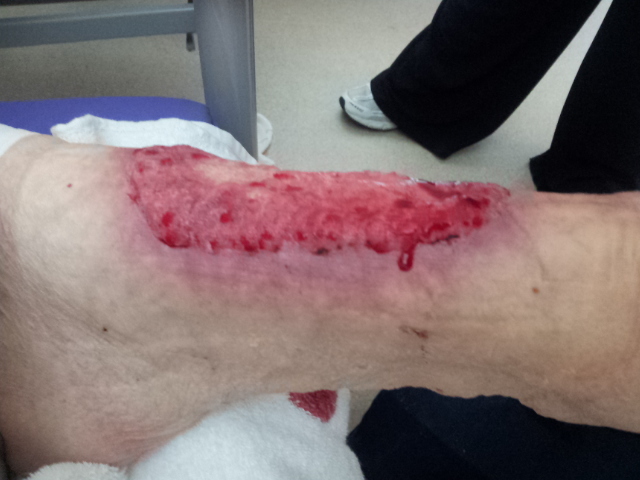 The lesion has raised edges and a base of raw tissue which does not appear to have any fascial component. The surrounding skin is purple with distended veins. The lesion is bleeding. There is no pigmentation. b. what is the likely histological diagnosis? Describe the appearance. c. how would you manage this lady? Being elderly and frail, managements decisions should be made with an accurate view of her likely mortality. Given that this is a growing, persistent and consistent problem for adequate nursing of the patient, frailty is only a relative contraindication to treatment. Presuming the lesion is a BCC, cure is probable even with such a large lesion. The therapy options to affect cure are surgery and radiotherapy. Surgery would represent a significant risk w.r.t anaesthesia and produce a significant additional nursing workload. The post-operative risks are also higher than usual. Radiotherapy however carries little of these risks and would require little change in her management apart fro attendance for treatment. Curability is probably equal between the modalities. d. how would you treat this lady in the eventuality that surgery is denied? I would treat this lady with curative intent which would be provided when definitive radiotherapy achieves local control. I would use a hypofractionated course of treatment as transportation will be an issue and the area is not in an area prone to greatly increased late effects from hypofractionation. In the simulator, I would position the left anterior thigh with the hip and knee flexed, placing 1cm of bolus over the lesion and mark the lesion and coloured skin. I would define a field 1cm greater than the skin change and mark this with a wire. On the planning CT, I would arrange a pair of parrellel opposed beams to match the inferior extent of the wires on either side. I would treat with a 6MV X beam to a dose of 40Gy in 10 fractions (34Gy/Fx) to the mid plane. I would expect that the beams would use wedges (15-30 degrees) and treat every day. I would counsel the nursing staff about skin care which would consist of a non-adhesive dressing, and ask to see her again in 6 weeks to assess response.